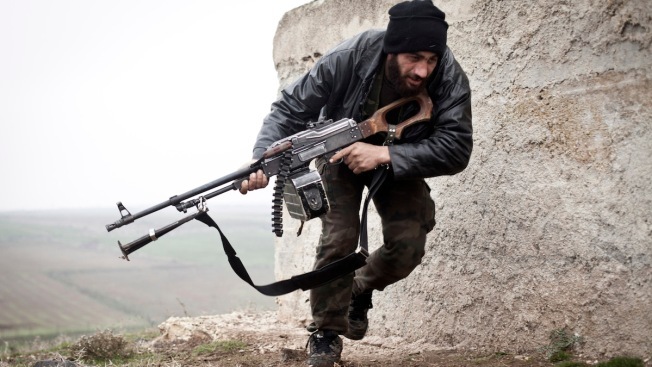 In this December 17, 2012, file photo, a Free Syrian Army fighter takes cover during fighting with the Syrian Army in Azaz, Syria. The Pentagon will announce Friday the official end of its failed program to "train and equip" Syrian rebels and replace it with a far less ambitious program, NBC News reported. The "training" part of the program — which managed to field only "four or five" Syrian rebels in the battle against ISIS in Syria at a cost of about $50 million — will be halted, according to senior defense officials. Instead of combat training for the rebels, they will now be used as "enablers" to identify targets and call in airstrikes for U.S. and coalition warplanes.